General W.R. Monger: I'm so proud of you monsters, I'd cry if I hadn't lost my tearducts in the war. But not crying will have to wait. The world needs you again. Susan Murphy: What is it, general? General W.R. Monger: Seems a snail fell into a French nuclear reactor. As I speak, Escargantua is slowly making his way to Paris. Susan Murphy: Well, I've always wanted to go to Paris. Now, who's with me? The Missing Link: What do you say, Butterfly... osaurus? The Missing Link: We're in. Dr. Cockroach Ph.D.: Count me in too. 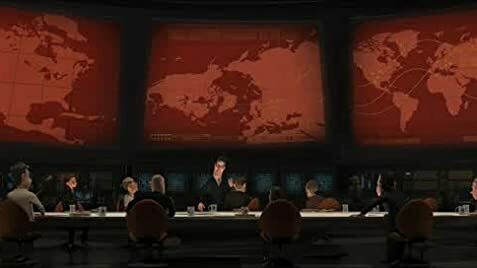 Q: What is "Monsters vs. Aliens" about? Q: Why didn't Ginormica's hair go back to being brown after it turned white? 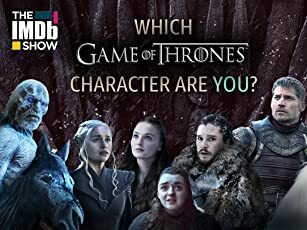 Q: What dose B.O.B. stand for? The President of the United States (Stephen Colbert): "Boys, set the terror level at code brown, 'cause I need to change my pants." Monsters vs. Aliens is my first 3-D movienot really, but it is the first time I have felt the process worked within a film as an integral part of the artistic process. It supports the science fiction, titillates at times, but most of all gives the illusion of reality. DreamWorks can be proud of this addition to the pantheon of excellent contemporary animations (dominated by Pixar) that use its Shrek as a touchstone for memorable characters wedded to mature themes and superior techniques. 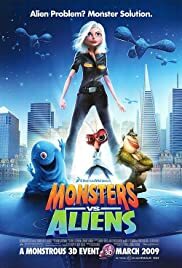 Monsters vs. Aliens is also a family film in the truest sense: Elders to tots can enjoy the visual delights of 3-D outer space and observe a young bride-to-be Susan Murphy (voice of Reese Witherspoon) grow by a radiation accident into the heroic role of Ginormica, a woman literally too big for her britches. She must assert her independence from a self-centered fiancé and convince family, friends, and the world that an out-sized woman (read overachieving feminist) has a place in the male world, a superior place at that. A strength of this sweet film is its use of ironic, sometimes sardonic, language to satirize just about everyone, from the president (see the opening quotation, not great humor but entertaining) to the makers of Close Encounters of the Third Kind, whose feel good '70's glow is ripe for 21st-century cynicism, to memories of such chestnuts as The Blob and The Creature from the Black Lagoon. The hip,loving mood of the film is exemplified by the alien's proclamation at invasion time, "Humans of Earth, my quest has led me to your planet. Give it to me now! You should, in no way, take any of this personally. It's just business." 72 of 118 people found this review helpful. Was this review helpful to you?